Cat Friendly Practice Co-Chair Celebrates Anniversary Too! Dr. Colleran is a Cat Friendly Practice Co-chair, American Association of Feline Practitioners (AAFP) Board Member, author, task force committee chair, and speaks regularly at veterinary conferences. She has successfully run two feline veterinary practices. For these accomplishments and more Germinder proudly salutes Dr. Colleran’s accomplishments. “Selecting Dr. Colleran as the next Honoree was an exciting choice. Dr. Colleran’s leadership with the Cat Friendly Practice and so many other initiatives has been brilliant. She gives and gives and gives quietly to the profession and to all around her. It’s always a “how can I help” and the wheels in her head start turning. If she can’t help, she will let you know who can. And, she’s a successful business woman to boot,” said Lea-Ann Germinder, APR, Fellow PRSA, president of Germinder + Associates. Dr. Colleran has designated the Winn Feline Foundation as the recipient of a donation from a special Germinder + Associates 20th Anniversary Fund in her honor. The Winn Feline Foundation advances feline health by supporting research and education. “I am delighted and humbled to accept this award during our own anniversary year. All the campaigns, all the work is to benefit the magnificent felines we veterinarians treat every day. Thank you to Germinder for recognizing not only the work but for the donation to the Winn Feline Foundation to continue to benefit them,” said Dr. Colleran. 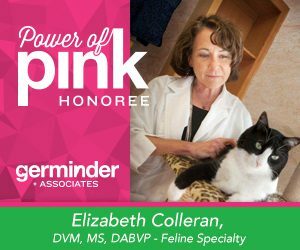 Colleran most recently collaborated with Germinder on Germinder’s launch of the GNFP Digital feline pain management module, but their relationship goes back twenty years. Colleran is one of the early AAFP leaders who introduced Germinder to feline veterinary medicine during Germinder’s work with Hill’s Pet Nutrition, Inc. The “Seven Subtle Signs of Sickness” campaign underwritten by Hill’s was one of the first to communicate to general practitioners and the cat-owning public on what to look for in sick cats. She and her colleagues at AAFP have tackled some of toughest issues facing the veterinary profession – and still do to this day. The development of the Cat Friendly Practice is the most recent example.